1. The Holy Scriptures: We believe the Old and New Testaments of the Holy Bible in its original writings is the verbally and plenary inspired word and revelation of God; that it is literally true from Genesis 1:1 to Revelation 22:21; and, therefore, we look to it as our only authority in matters of faith, practice, and daily living. The King James Version of the Bible shall be the official and only translation used for preaching and teaching by the church. II Tim. 3:16,17; II Peter 1:19-21. Matt. 28:19; Jn. 14:16,17; 10:30. 3. The Person and Work of Christ: We believe in the absolute deity of the Son, the Lord Jesus Christ1; that He is the Creator and Sustainer of all things2; that He was conceived by the Holy Spirit and born of the Virgin Mary3; that He lived sinless among men4 that He died on the cross as a substitute for us shedding His blood for the remission of our sins5: that He was buried6; that He arose physically from the grave7: that He ascended into heaven and in His bodily presence sits at the right hand of the Father ever making intercession for us8; and that He is coming again, visibly and at any moment9. 1Jn.1:1,l4,15,18,29,30; Lk. 3:22. 2Jn. 1:3: Col. 1:6,17; 3Lk. 1:31,35; Isa. 7:14; Matt.1:18-25. 4Jn. 8:46 Heb. 4:14,15; 7:26-28.5Matt. 26:28; I Cor. 15:3; I Pet. 2:24; Heb. 9:22b; Eph. 2:13. 6Jn. 12:24; I Cor 15:4a; 7Psa. 16:10; Jn. 2:19, 21, 22; Mat. 28:6a; I Cor. 15:4b. 8Acts 1:9; 7:55, 56; Col. 3:11; Heb. 7:25; I Jn. 2:1. 9Acts 1:11; I Thes. 4:16; Zech. 14:4. 4. The Person and Work of the Holy Spirit: We believe in the personality and deity of the Holy Spirit1 and that among other ministries He convicts of sin, of righteousness, and of judgment2 that He bears witness to the truth3 that He is the Agent in the new birth4; and that He seals5, endues with power6, guides7, teaches8, witnesses to9, sanctifies10, and helps11 the believer, indwelling every true child of God12, 1Jn. 14:16,17,26 16:7-14; Acts 5:3,4 2Jn. 16:8-11 3Jn. 16:13. 4Jn. 3:5,6 5Eph. 1:13 6Lk. 24:49; Acts 1:8 7Jn. 16:13; Rom. 8:14 8Jn.14:26 9Rom. 8:16. 10I Pet. 1:2. 11Rom. 8:26. 12I Cor.3:16; 6:19; Rom. 8:9. 5. Satan: We believe in the reality and personality of Satan1; that he is the unholy god of this world2; and that he is the author of all the powers of sin and darkness3 and is destined to an eternal judgment in the lake of fire4. 1Matt. 4:1-11; Rev.12:9, 2II Cor. 4:3,4. 3Isa. 14:12-15; Jn. 8:44; Eph, 2:2; 6:12,13 4Rev. 20:l0. 6. Man and Salvation: We believe that man was specially created by God1, that by original sin all have come under the condemnation of God, and that the only way of salvation is in individual confession of sin and by grace personally trusting in the redeeming work of Christ on the cross2. 1Gen. 1:26,17; 2:7; 5:1,2; 2Rom. 3:23; 5:12; Jn. 3:18; Acts 3:19; 16:30,31; Eph. 1:7; 2:8,9: Jn.10:9-11 14:6. 8. The Church: We believe that the New Testament church is the entire body of believers in Christ1 which when completed will be His bride2. That its mission is to glorify God in evangelism by winning men to Christ, in edification by building them up in Christ, and in missions by sending them out for Christ3; and that in its local aspect it consists of a regenerated and baptized membership4 and is independent and self governing5. 1Matt. 16:16-18: I Cor. 12:12; Eph. 1:22, 23. 2II Cor. 11:2 Eph. 5:25-27. 3Matt. 28:18-20 Eph. 4:11-13 Acts 13:1-3. 4Eph. 2:8,9,19-22; Col. 1:2,4: Acts 8:12: Rom. 6:3,4. 5II Thes. 3:6; I Cor. 14:40. 9. Church Ordinances: We believe that there are two church ordinances : baptism and the Lord's Supper1: that the only true Biblical baptism is the immersion of the believer in water2 and that the Lord's Supper, which is the commemoration of the Lord's death until He comes, is a witness of the believer's continued fellowship with Him and should be preceded by baptism and careful, self-examination3. 1Matt. 28:19; I Cor. 11:23-25. 2Acts 8:36-39; 10:47 Rom. 6:3,4 Jn. 3: 23. 3I Cor. 11:26-30: 10:21 Acts 2:41,42,46. 10. The Eternal State: We believe in a final judgment when all will appear before the Lord, that the righteous will inherit an endless conscious bliss in heaven, and that the wicked will receive an endless conscious punishment in hell. II Cor. 5:10: Rom. 14:12: I Cor. 3:13 Rev. 20:11-13; Matt. 25:31-46 Lk.16:19-31; Jn. 5:28, 29 Phil. 1:21,23 Psa. 9:17 Rev. 20:15; 21:8. This statement of faith does not exhaust the extent of our faith. The Bible itself is the sole and final source of all that we believe. We do believe, however, that the foregoing statement of faith accurately represents the teaching of the Bible. 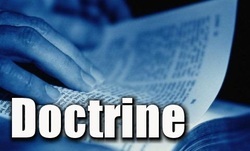 Before any man can be considered as pastor of this Church, or any person received into the membership of this Church, they must accept in its entirety the above statement of doctrine as well as the covenant of the Church.